Huge, expensive data warehouse projects often either deliver a huge compromise in terms of functionality, or are impossibly complex and expensive. A bunch of them fail outright. 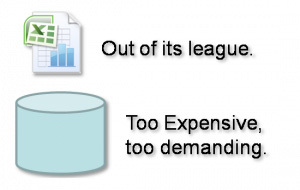 Why do so many people turn to Excel for their analysis needs? Because with excel they are in control. With Excel it IS personal. Massive, expensive data warehouses are one size fits none. Excel is the ultimate in customisation. Many users frustrated by the limitations in Excel in terms of data volume and functionality want more. 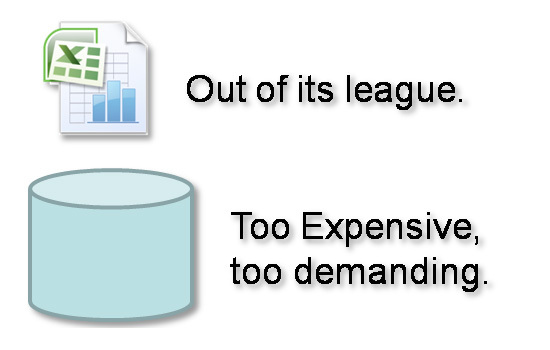 Some of them take up programming macros- others spend money they'd rather not on throw away database development. But demand encourages supply, and new tools are beginning to emerge. The Datamartist vision is that of a user driven tool that provides the flexibility of a spreadsheet with the key functionality of a database without the database. Personal data marts can for the first time be built directly on the desktop, without programming, yet handling millions of rows of data, and implementing truly useful data analysis.